Before The Little was born, I went impressively overboard on a stock-the-freezer mission. It was part hoarding, part planning-for-the-apocalypse but I just knew I’d never ever have the time or energy to prep dinner again for the next 5+ years. Most of it was your standard fare (enchiladas, pasta, soups, pizza dough, muffins, pulled pork, etc) – anything to help us feel like we had the ease of shopping in the freezer section for every meal without the calories, unpronounceable ingredients, and sodium bombs that actually come with shopping in the freezer section for every meal. Even quicker than homemade personal frozen pizzas, this one starts with a loaf of bread that someone else made. Then you bake the bread for a few minutes, top with your favorite freezer-friendly pizza toppings (no fresh tomatoes – wait ’til later for those), and freeze. My current favorite pizza: the pepperoni and hatch chile. Still. When you’re read to eat, pop them back into the oven, adding any fresh ingredients (tomatoes go here! ), and then enjoy your “long pizza” for dinner! 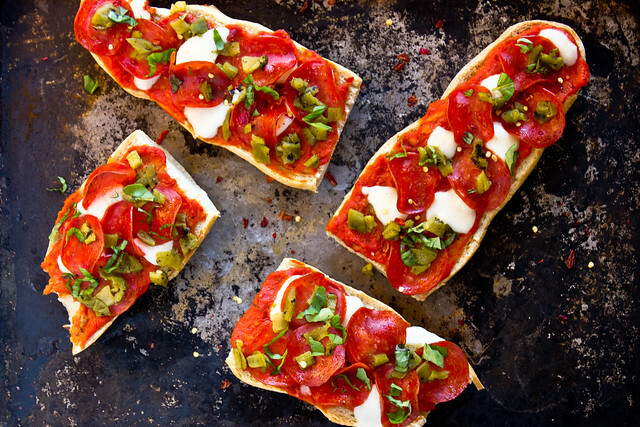 Homemade freezer french bread pizzas, healthier and fresher than store-bought pizza. Place cut bread on a baking sheet (use a knife to cut and create a flat spot on the bottom of any bread piece that's wobbly). Lightly spray or brush the cut surface of the bread with olive oil and bake 7-8 minutes, until crispy and golden (but not overly browned). 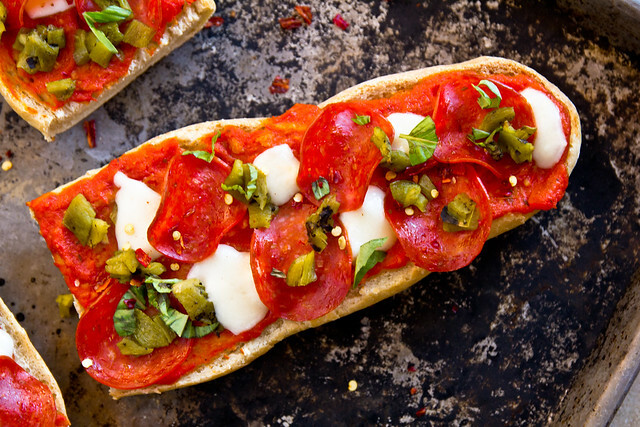 Top with marinara, cheese, and freezer-friendly toppings like pepperoni, roasted peppers, etc. Save things like fresh tomatoes for topping just before and fresh basil or arugula for just after baking). Place back on the baking sheet and put in the freezer until frozen solid, 1-2 hours. Transfer the frozen pizzas to gallon zipper bags and freeze. To cook, preheat the oven to 425 and bake 12-15 minutes, until the edges of the pizza are very brown and the cheese is bubbly and melted. I love French bread pizzas, but never make them at home. The ability to freeze for a quick lunch makes them even more appealing! My mom made a lot of ciabatta bread pizza for us when we were little….can’t believe she never thought to freeze it and have it ready at a moment’s notice! 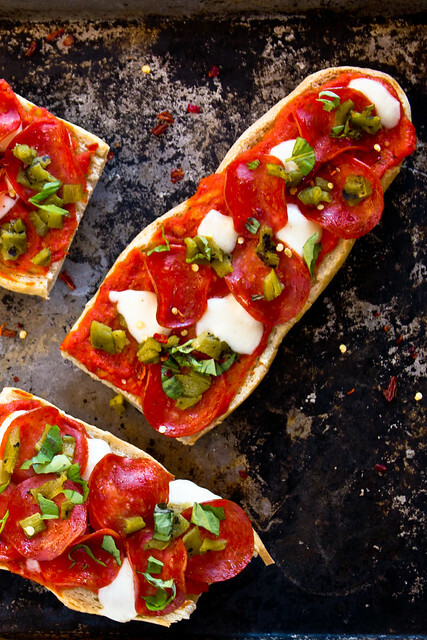 I’ve frozen pizza bagels before but never thought of French bread pizza! Yum! I love this idea Shawnda! I am always in the search for easy freezer meals. I LOVE this idea! It’s never even occurred to me, and I do (gasp!) always keep at least one frozen pizza in the oven for “emergency” purposes! 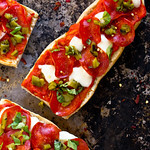 I love this-I made pizza flatbreads last night so I may have to try freezing them! “Preparing for the apocalypse” – hahah! That is both funny and frightening. 😉 Thanks for sharing these scrumptious pizzas. Great freezer meal! What a great idea!! I never would have thought to do this!